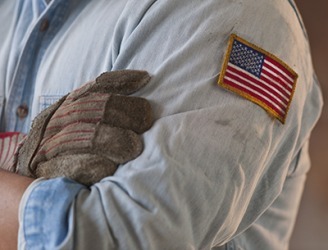 The worker has a patch of the American flag sewn on the sleeve of his shirt. The definition of a sleeve is the part of a shirt or other garment that covers your arm, or a protective covering that fits over something, such as a record. The cotton material that extends from the shoulder of your shirt down to your wrists is an example of a sleeve. The white paper envelope that a CD or record fits into is an example of a sleeve. "sleeve." YourDictionary, n.d. Web. 17 April 2019. <https://www.yourdictionary.com/SLEEVE>. A part of a garment that covers all or part of an arm. A case into which an object or device fits: a record sleeve. A tattoo that covers all or a large part of the arm. Middle English sleve from Old English slēf ; see sleubh- in Indo-European roots. (British Columbia) A serving of beer measuring between 14 and 16 ounces. From Middle English sleve, from Old English sliefe, slefe. She clutched his sleeve as he turned away. He lifted a sleeve and consulted his watch. Taran complied and rolled up his sleeve to display his bandaged forearm. He pushed her sleeve up to see her band. He wore the long-sleeve knit shirt, snug enough to show his physique without clinging to it, the snug jeans low on his lean hips.